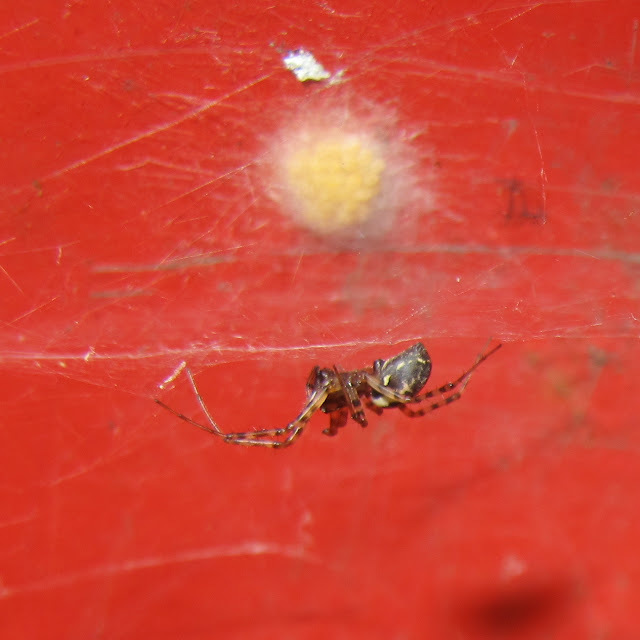 The contrasting red background of a kids wheelbarrow, made it easy to spot the egg sac of this Neriene montana female. The yellow eggs are visible through the loose, gauze-like silk wrapping of the egg sac. The female hangs upside down on her hammock web by the egg sac. She may possibly be able to lay more egg batches, as the female lives up to 7 months. Although egg guarding has not been reported in many money spiders and I could find very little on the reproductive behavior of this species, this photo confirms that the eggs may be laid very close to the web and will undoubtedly benefit from the female being nearby.